Militants seized Iraq's second-largest city June 9, officials said, in another blow to the authorities, who appear incapable of stopping rebel advances. Overnight, hundreds of gunmen launched an assault on Mosul, 350 kilometres north of Baghdad, engaging in combat with troops and police, they said. The Islamic State of Iraq and the Levant (ISIL) has also reportedly taken 28 Turkish truck drivers hostage. The drivers had been travelling from the southern Turkish city of İskenderun to the Geyara Thermal Power Plant in Mosul, Doğan News Agency reported. A senior Turkish official told Reuters that Turkey is investigating media reports. "These truck drivers were taking fuel to an energy storage and distribution hub. When they arrived, ISIL (militants) were already there," the official told Reuters, adding that Foreign Minister Ahmet Davutoglu was in contact with Iraqi, Kurdish and U.S. officials to try to ensure their safe release. "They were detained (by the militants), they haven't been hijacked ... They're unharmed as far as we're aware. When they've finished transferring the fuel we're hoping that they will be freed," another Turkish official said. Foreign Ministry officials told the Daily News that contact had been lost with 28 drivers in Iraq. They said they could not yet ascertain whether the drivers had been abducted by ISIL militants or were simply stuck somewhere in the region, and were still working to find more details. The phone lines of the Turkish Consulate in Mosul have been cut, though Ankara can still communicate with Consul Öztürk Yılmaz through his cellphone, Hürriyet's Uğur Ergan has reported. Yılmaz recently survived a bomb attack while traveling to the northern city of Arbil. Before the entire city fell, militants took control of the governor's headquarters, prisons and television stations. "The city of Mosul is outside the control of the state and at the mercy of the militants," an interior ministry official told AFP, making it the second city to fall to anti-government forces this year. An AFP journalist, himself fleeing the city, said shops were closed, security forces had abandoned vehicles and a police station had been set ablaze. Kurdistan Regional Government (KRG) Prime Minister Nechirvan Barzani has called on the people of the Kurdish region to help the displaced people of Mosul, while accusing the central government of not cooperating with the KRG against militants. “In order to assist and support the displaced people of the city of Mosul, including all of the city’s different ethnic groups, I ask the people of the Kurdistan region to help the displaced people of Mosul in whatever way they can within the framework of legal and security guidelines. I also urge the United Nations High Commission for Refugees [UNHCR] to provide relief and support for the displaced people fleeing the violence in Mosul,” he added. Mosul is the capital of Nineveh province. In recent days, militants have launched major operations in Nineveh and four other provinces, killing scores of people and highlighting both their long reach and the weakness of Iraq's security forces. Mosul is the second city to fall to militants this year, after the government lost control of Fallujah, just a short drive from Baghdad, in early January. Heavily-armed, Al-Qaeda-affiliated militants have seized the Iraqi city of Mosul, driving back government forces. Officials say the Iraqi Army’s soldiers are demoralized and are no match for the attacking militant forces. On Monday night fighters from Al-Qaeda affiliated group Islamic State in Iraq and the Levant (ISIL or ISIS) stormed provincial government headquarters armed with rocket-propelled grenades and heavy machine guns. The city’s governor, Atheel Nujaifi, was caught inside the building at the time of the attack, but managed to escape, while local police battled to fend off the militants. Earlier that day Nujaifi appealed to the inhabitants of Mosul to fight the invaders. "I call on the men of Mosul to stand firm in their areas and defend them against the outsiders, and to form popular committees through the provincial council," said Nujaifi in a statement. Unnamed officials told Reuters that government fighters were demoralized and seriously outmatched by the militant forces. In response to the escalation, Prime Minister Nuri al-Maliki has called on parliament to declare a state of emergency. The Prime Minister has been struggling to control the recent outbreak of sectarian violence in the country. Al-Maliki is a Shiite Muslim and has become unpopular with Iraq Sunni minority, which has accused the government of discrimination. Nechirvan Barzani, Prime Minister of the Kurdistan regional government of Iraqi Kurdistan laid the blame for the siege at the feet of the Iraqi central government in a statement on Tuesday. He claimed they had been warned that ISIS forces were converging on Mosul, but failed to take any action. I was just about to post this. This is unimaginable. This ISIS group is even worse than Al Queda. The Iraqi state seems to have no control. Have the gulf arabs created a noose for their own necks? The likes of KSA, Kuwait, Qatar have long supported and funded extremists as an extension of unstated foriegn policies. These chickens are coming home to roost in Pakistan, will in the future the same be true for them? Can you imagine the impact on stability if this groups takes control of a large part of Iraq? I think the Arabs would be wise to setup an alternative Sunni faction, someone who could take power from both ISIS and the Iranian/American stooge Maliki otherwise this cancer will engulf their kingdoms too. @butterfly: Pakistan is not fighting the ISIL and it's not our job to take them out. If you meant the TTP and assorted foreign militant groups then I am with you. @Plat: If the Gulf countries once again try to create a "counter group"....the mistake will fundamentally repeat itself. Only the people and government of Iraq can solve this issue in their country. They bought those 12 F-16's and now it is the time to use them. Another issue in Iraq is that the Iraqis put their sector and ethnicity first...even before Iraq itself. The current ruling majority is extremely corrupt and they are taking out their decades of frustration built during Saddam's tenure. The sector which was blessed during Saddam's regime is now all cry-baby because they don't like the new setup...although they are in clear minority they would still like to rule. Therefore there is a large segment of population inside Iraq which is supporting ISIL and their likes. Plus there are some wealthy people, not the govt. necessarily but might include some royalty, in brotherly neighbouring countries who are funding ISIL and other terrorist groups. Another issue in Iraq is that the Iraqis put their sector and ethnicity first...even before Iraq itself. Well that doesn't suprise me. Iraq is an unnatural entity, it's never existed as a state, it's a remnant of colonialism. The entire middle east is, that's why it's only stable under dictatorships kingdoms. I would disagree with you there.....the arabs have maintained their tribal and cultural borders with distinction for centuries.....Iraq has been a distinct, unique land and remains so today. Woh alag baat hai kay subsequent battles and cultural decline has screwed the people over. The only artificial country you can say is Lebanon. Jihadist insurgents have seized up to 48 people in the Turkish consulate in the northern Iraqi city of Mosul, including the consul and three children, Ankara sources told Reuters. Some 500,000 people fled the Iraqi region occupied by an Al-Qaeda offshoot. The Turkish Consul-General in Mosul, Ozturk Yilmaz, several members of Turkey’s special forces and three children are among the Turks taken hostage by the militants of the Islamic State in Iraq and the Levant (ISIS / ISIL), Reuters reports citing sources in the Turkish prime minister’s office. Turkish Prime Minister Recep Tayyip Erdogan was holding an emergency meeting on the situation, Hurriyet reports. According to Turkish media, the captors are holding diplomats in militant headquarters and unharmed. Turkish Foreign Minister Ahmet Davutoglu reportedly cut short his visit to the US and flew back to Ankara in connection with the Mosul hostage-taking. Davutoglu was due to deliver a speech at a UN counter-terrorism meeting in New York. The Turkish Foreign Ministry meanwhile said it was verifying the information amid conflicting reports. The radical Sunni militants have already taken hostage at least 32 Turkish nationals – truck drivers – in the area since Tuesday, according to Hurriyet. “Certain militant groups in Mosul have been directly contacted to ensure the safety of diplomatic staff,” a Turkish government source told the agency. The Turkish government has earlier been accused of assisting jihadist groups fighting in Syria against Syrian President Bashar Assad’s government. Damascus complained to the UN in March that Turkey was providing cover to rebels crossing the border from Turkish territory, which allegedly included several Al-Qaeda affiliates. Some 225km (140 miles) south of Mosul, the ISIS militants have seized the city of Tikrit, Iraqi security officials told AP on condition of anonymity. According to the report, the provincial governor has gone missing from the city. Tikrit, just 150 kilometers (95 miles) northwest of Baghdad, was the hometown of President Saddam Hussein, who was overthrown in the US-led military operation. Earlier, ISIS boasted the capture of Iraq’s biggest oil refinery north of the city of Baiji, claiming it had“seized it without a shot.” The oil refinery, located less than 180km (110 miles) from Mosul was one of the strategic objects secured by the US-led forces in the 2003 invasion of Iraq and thoroughly searched for “weapons of mass destruction.” No chemical agents were ever found there. On Monday night, fighters from Al-Qaeda splinter group ISIS stormed provincial government headquarters armed with rocket-propelled grenades and heavy machine guns. “The city of Mosul is outside the control of the state and at the mercy of the militants,” an Interior Ministry official told AFP on Monday. It is now the second city to fall under control of Islamist fighters since the beginning of this year. In January militants seized the city of Fallujah, displacing over 70,000 people. Hundreds of thousands of people are believed to have fled Mosul and the northern Iraqi province of Nineveh, which the jihadists have largely taken under control. The International Organization for Migration (IOM) placed the number of refugees at 500,000. Those fleeing the region included demoralized Iraqi troops, who chaotically left their positions, dropping uniforms, weapons, munitions and military hardware. Assyrians, Sumerians, Mesopotamians, Babylonians all have their own history and culture, and they each continue to follow those. Sumer later become part of Mesopotamia sure, but still has distinction between themselves. Hence, you will find Arab, Syrian, Turkish, and Persian culture in Iraq. Edited by Felicius, 11 June 2014 - 08:52 PM. ISIS wrecked havoc in syria and now its iraq's turn. news report confirm that the iraqi military threw their weapons and ran away. think back to the images from desert shield/storm enduring freedom or whatever the heck it was called and now reports o f Iraqi soldiers fleeing in the face of opponents; Iraq is is the France of the middle east--what a bunch of surrender monkeys! KIRKUK: Militants have seized the Iraqi city of Tikrit as a jihadist offensive sweeps closer to Baghdad, prompting the UN Security Council to convene crisis talks Thursday while the US mulls air strikes on the rebels. The Islamic State of Iraq and the Levant (ISIL) seized the second city of Mosul on Tuesday and has since captured a large swathe of northern and north-central Iraq including Tikrit — the hometown of executed dictator Saddam Hussein. ISIL spokesman Abu Mohammed al-Adnani promised the battle would “rage” on the capital Baghdad and Karbala, a city southwest of the capital that is considered one of the holiest sites for Shia Muslims, the SITE Intelligence Group said. The UN Security Council swiftly convened a meeting to discuss the crisis in a sign of growing international alarm at the fast-moving situation. Diplomats said the closed consultations would begin at 11:30 am and will include a briefing by video link from the UN special representative to Iraq, Nickolay Mladenov. Washington is considering several options for offering military assistance to Baghdad, including drone strikes, a US official told AFP on condition of anonymity. Resorting to such aircraft — used in Afghanistan and Pakistan in a highly controversial programme — would mark a dramatic shift in the US engagement in Iraq, after the last American troops pulled out in late 2011. State Department spokeswoman Jen Psaki said the US was committed to “working with the Iraqi government and leaders across Iraq to support a unified approach against ISIL's continued aggression. “But there is no current plan to send US troops back into Iraq, where around 4,500 American soldiers died in the bitter conflict. White House spokesman Jay Carney said Washington “strongly condemns” the ISIL attacks and “will stand with Iraqi leaders”. ISIL vowed on Twitter that it would “not stop this series of blessed invasions” that have seen the fall of the whole of Nineveh province in the north and swathes of Kirkuk and Saleheddin provinces further south. Tikrit was the second provincial capital to fall in as many days as the jihadists and their allies captured a string of mainly Sunni Arab towns where resentment against the Shia-led government runs deep. “All of Tikrit is in the hands of the militants,” a police colonel said of the Salaheddin provincial capital, which lies half way between Baghdad and Mosul. Another officer said the militants had freed some 300 inmates from a prison there. After Tikrit's fall, the operation spread down the main highway towards Baghdad, with militants battling security forces on the northern outskirts of Samarra, just 110 kilometres (70 miles) from the capital. State television said security forces responded with air strikes, and residents said the fighting subsided without the militants entering the city. Militants had already tried to seize the city late last week, and were halted only by a massive deployment of troops, backed by tribal militia and air power. Samarra is mainly Sunni Arab but is home to a shrine revered by the country's Shia majority, a site that was bombed by Al Qaeda in 2006, sparking a Shia-Sunni sectarian conflict that left tens of thousands dead. The lightning advance poses significant challenges to Baghdad, with the New York-based Eurasia Group risk consultancy saying jihadists would be bolstered by cash from Mosul's banks, hardware from military bases and hundreds of men they freed from prison. In his weekly address Wednesday, Prime Minister Nuri al-Maliki merely renewed his call to arm civilians to resist the jihadists. Maliki urged Nineveh's residents “and its tribes to stand with the army and police. “In Tehran, Foreign Minister Mohammad Javad Zarif said Shia Iran “offers its support to the government and people of Iraq against terrorism. “The swift collapse of Baghdad's control, which comes on top of the loss of Fallujah, west of Baghdad, at the start of the year, has been a blow for Western governments that invested lives and money in the invasion that toppled Saddam in 2003. However, Foreign Secretary William Hague said there was “no question” of British troops being sent back to Iraq. The International Organisation for Migration said sources in Mosul estimated the violence leading up to the jihadists' takeover saw over 500,000 people displaced in and around the city. On Wednesday, gunmen in military uniforms and all-black clothing guarded government buildings and banks in the city, residents told AFP by telephone. Militants stormed the Turkish consulate and kidnapped 49 people including the head of the mission and three children, a Turkish official said. They were in addition to 31 Turkish truck drivers seized by ISIL at a Mosul power station, and Ankara pledged harsh reprisals if any were harmed. Known for its ruthless tactics and suicide bombers, ISIL is arguably the most capable force fighting President Bashar al-Assad inside Syria as well as the most powerful militant group in Iraq. In a show of its determination to unite its thousands of fighters in the two countries, the group posted photographs on the Internet of militants bulldozing the border berm to open a road. This will happen in Afghanistan after the Americans leave. Afghan national army won't be seen anywhere. Pakistan will have problem with TTP but they may have better options with the afghan Taliban. At least India won't call the shots in Afghanistan and that's for sure. There is only one country to blame for this global mess. AMERICA. where did the brand new IqAF F 16s go ? and the Mi 35s ? The things are now coming to SHIA VS SUNNI. Soon we will see a great rieft among Middle eastern SHIA & SUNNIs due to these events. The US and Iran have found a rare common cause in this instance.....it will be interesting to see what happens. ^^^ US and Iran have found numerous common causes in recent history and cooperated with each other. One example is Iran giving US access to its airspace during the US led invasion of Iraq. All the warfare is based on deception. all these wars, civil wars are small events compare to the big one in the back ground. What serves the west more? having peace in the middle east or having all these people killing each other? First they divided the Ottoman empire in pieces and then distributed that land in ethnicity and promoted the sectarianism. Then Supported the dictators and Monarch. Then help who ever can take over. Then made Iran and Iraq fight and turned it in region wide sectarian divide. Then they invaded Iraq, over through the Dictator that they supported before against Iran. Dictators toppled who kept the status que and stability in the region. American provided the military support, weapons, finance. You name it. Now all of a sudden we hear about Iraq is being over run by a group so extreme and powerful that Al-Qaida look like a liberal comparing to it. Be ready to expect the worse. After enough blood is spilled, the region will further divided into ethnicity and sectarian lines. It will be make only easier for the west to keep the region in check and eliminate the danger of any emergence of power that challenge the hegemony of West in the region. Its all about prolonging the Western rule and dominance. The sooner the people (pawns) realise this and truly understand this....is when there can finally be genuine peace, stability and progress in the cradle of civilisation. But they are too full of anger, fear and mistrust now to see beyond the hilt of the sword...to the big grey sky of the bigger picture. Brother killing brother, Hate killing Love, Ignorance killing Wisdom.....there is a Great chastiser up there and He will put this all straight one day....but will we live to see it? Perhaps we would have had the system of Caliphate today if the tribes in Arabian Peninsula would have supported the Ottomans but instead they decided otherwise. They sought help from the British(or rather accepted their help) to end it all. Iraq...well whenever I used to speak to my Iraqi colleagues, the ones who were mega-fans of Saddam Hussein, they used to boast of how he gassed and decimated entire villages of Kurds and how he kept other sectors "in their place". With this kind of mentality how can one progress? Human-beings are not good beings. Period. They exploit each other, they are in constant conflict with each other, they seek division instead of unity, they seek power over each other, they seek to dominate their point of view over others, they seek to hoard resources for their "own kind". Greed...greed and greed. Fact is which ever "group" will evolve, adopt progress and pragmatism, adopts "human rights for their own" etc. will continue to dominate and exploit the others for their own benefit. BAQUBA: Iraqi forces clashed with militants advancing on the city of Baquba, just 50 kilometres (30 miles) north of Baghdad, on Friday, as an offensive spearheaded by jihadists drew closer to the capital. Security forces were battling militants on the outskirts of Muqdadiyah, 35 kilometres (23 miles) northeast of Baquba, police and army officers said. Baquba is the capital of Diyala province, whose mixed Arab, Kurdish, Sunni and Shiite population has made it a byword for violence ever since the US-led inavasion of 2003. The militants have already captured two provincial capitals this week -- Tikrit in Salaheddin province and second city Mosul in Nineveh. President Barack Obama said Washington was examining “all the options” to help Iraq's beleaguered security forces resist the offensive, spearheaded by the Islamic State of Iraq and the Levant (ISIL), which began in Mosul late on Monday. Washington has found rare common cause with its longtime foe Tehran, with both voicing dismay at the Sunni extremists' advance and pledging to boost aid to the Shiite-led government. ISIL spokesman Abu Mohammed al-Adnani vowed its fighters would press on to the capital and, further south, to the Shiite shrine city of Karbala, visited by millions of pilgrims from around the world each year. Radical Sunni militants of Al-Qaeda offshoot, the Islamic State in Iraq and the Levant (ISIS/ISIL) are advancing and capturing cities in the north of Iraq. The jihadists have declared the capture of the capital Baghdad as their top priority objective. 10:25 GMT: Iraq’s Grand Ayatollah Sistani, one of the country's most influential clerics, urges Iraqis to take up arms and defend their country. 10:11 GMT: Sunni jihadists are preparing for an assault on Samarra, home to a revered Al-Askari Shia shrine, a terror attack on which back in 2006 already sparked a sectarian war in Iraq. 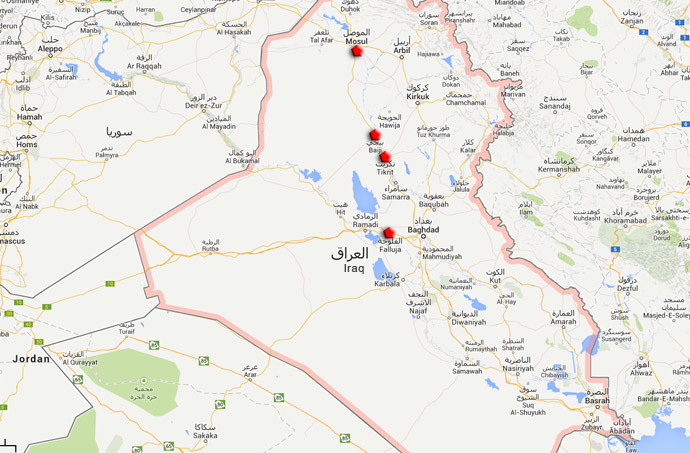 The militants have already tried to capture Samarra, 110km from the capital, Baghdad, twice over the last two weeks. The local tribal security forces have turned down the proposal of the militants to leave peacefully though militants promised not to destroy the shrine. A bomb explosion in 2006 resulted in mass fighting throughout the country and the deaths of tens of thousands of people. 9:35 GMT: The number of people killed after Sunni Islamist militants overran the Iraqi city of Mosul may run into the hundreds, UN human rights spokesman Rupert Colville said. The killings included the execution of 17 civilians working for the police and a court employee. Four women had killed themselves after being raped, while 16 Georgians had been kidnapped, and prisoners released by the militants had been looking to exact revenge on those responsible for their incarceration, he said. "We've also had reports suggesting that the government forces have also committed excesses, in particular the shelling of civilian areas on 6 and 8 June," he said. "There are claims that up to 30 civilians may have been killed." Some, 500,000 were also displaced in the conflict. 6:08 GMT: Insurgents in Iraq continued their offensive on Thursday night, taking control of two towns in the province of Diyala, says Reuters. Fighters reportedly overran the towns of Saadiyah and Jalawla after security forces abandoned their posts. 23:58 GMT: Since last year, the US has secretly flown unmanned drones over Iraq to gather intelligence on insurgents, anonymous officials told The Wall Street Journal. Intelligence gathered in the limited program was supplied to the Iraqi government, which consented to the flights and is now locked in fierce battles across the nation with Al-Qaeda offshoot ISIS. "It's not like it did any good,” a senior US official said about the data collected on Islamist fighters who have captured Mosul and Tikrit, among other areas, in recent days. 22:26 GMT: The US State Department says US contractors in Iraq are being temporarily relocated by their employers due to security concerns, Reuters reported. "We can confirm that U.S. citizens, under contract to the Government of Iraq, in support of the U.S. Foreign Military Sales (FMS) program in Iraq, are being temporarily relocated by their companies due to security concerns in the area," said State Dept. spokeswoman Jen Psaki in a statement. 20:38 GMT: Oil prices have hit nine-month highs as a result of ongoing violence in Iraq, according to Reuters. ISIS fighters have surrounded the nation’s largest refinery, in the northern city of Baiji, leading to concerns of limited output from the second-largest OPEC producer. "The fear is that will cause a threat to Iraqi oil exports," said Christopher Bellew, a trader at Jefferies Bache. "If this conflict knocked out Iraq as an exporter, that would have significant impact on prices." 19:41 GMT: Turkey has called on any citizens in Iraq to leave the country. The Turkish Foreign Ministry has recommended that there is no travel to its southern neighbor, according to Hurriyet Daily News. The statement follows the abduction of 80 Turkish citizens who are being held in Mosul. Turkey has vowed retaliation if any are harmed. 19:33 GMT: Three planeloads of Americans are being evacuated from an Iraq airbase, AP reported. The base is located in a Sunni territory in the north of the country. Officials spoke on the condition of anonymity given the sensitivity of the situation. Will Obama try to re-fight the Iraq war? "Was withdrawal from Iraq just another campaign promise, made to be broken – like Obama’s pledges on government secrecy and other civil liberties issues? The president’s record, so far, does not bode well for an answer in the negative. "This administration of self-proclaimed ‘pragmatists’ has no problem dispensing with principles and promises when it’s convenient. And it is decidedly inconvenient to be getting out of Iraq at the very moment we are ratcheting up pressure on our new adversary in the region: Iran." At the time, this may have seemed a bit of a stretch: after all, the President had secured his party’s nomination – and the White House – largely on the strength of his promise to get us out. And the country, by that time, was more than ready to see the last of Iraq. So who could’ve foreseen that an American return to Iraq was in the cards? Well, anyone with half a brain, but unfortunately that doesn’t even come close to describing US policymakers and the alleged "experts" of Washington wonkdom. The regional war many of us predicted would be the inevitable result of the Iraq invasion is now upon us. A group expelled from Al Qaeda known as the "Islamic State of Iraq and the Levant," or ISIS, has mysteriously arisen, fully armed, like a Muslim Minerva from the head of Allah. Now in possession of Iraq’s second largest city – Mosul, population 2 million – ISIS controls roughly the western third of the country. And they’re marching eastward, taking Tikrit and converging on Karbala and Najaf – the sites of Shi’ite shrines, which the Sunni militants of ISIS are intent on destroying. Prime Minister Nouri al-Maliki is asking the White House for air strikes: Obama is saying "all options are on the table" – including, one presumes, troops on the ground. John McCain is already demanding it, and the outcry from the War Party is getting louder by the moment: Obama, they aver, must "do something." The Iraqi "army" we spent billions training and arming is useless: discarding their uniforms in the street, they can’t run away fast enough. Who will stop ISIS as they converge on the ultimate prize, Baghdad? The answer is: Iran. Tehran has already answered Maliki’s call to arms, with the elite Quds force taking up positions in the country, including in Tikrit, where they are reportedly retaking the province on the Iraqi government’s behalf. They are also stationed in Karbala and Najaf, guarding those two symbols of Shi’ite power. When the US invaded Iraq, and destroyed the secular Ba’athist regime, Washington effectively delivered the country to the Iranians. Indeed, Ahmed Chalabi, and his fellow "heroes in error" – who along with his neocon sponsors lied us into war – turned out to be Iranian agents: remember those US raids on his various Iraqi compounds? Tehran was the main beneficiary of the neocons’ war, and now they are moving to claim their prize – before it is ripped out of their hands by ISIS. This augurs a perfect storm of regional rivalries, one that sets every religious and political faction in the ‘Middle East’ up for a war of all against all. The second phase of the Iraq War has begun: the only question remaining is how big a role will the US play in it? "When any external or internal danger emerges against Iraq or an aggression upon it violates its sovereignty, its political stability, the unity of its land, water, and airspace or threatens its democratic system or its elected establishments and according to the request of the Iraqi government, the two parties will immediately start strategic talks and according to what they will agree on between them the United States will undertakes the appropriate measures that include diplomatic, economic, military or any other measure required to deter this threat." I can just hear the Obamaites justifying an American re-entry by claiming we have a "treaty obligation" to intervene. Whether this involves drone strikes or some type of air support and even sending in troops is irrelevant, at this point, since the reappearance of US soldiers on the ground is eventually going to be required if Washington decides to shoulder the responsibility of retaking Mosul and environs. In any case, we have only to consult the theory of what I call "libertarian realism" – the idea that a nation’s foreign policy is determined by internal political factors rather than by objective considerations – to predict what the eventual outcome of this latest "crisis" will be. Rather than be haunted by the accusation that he and his party "lost Iraq," and that the thousands of Americans killed and hideously wounded in that war sacrificed for nothing, the President will start us down the path to re-intervening in a big way. And if his successor in the Oval Office is Hillary Clinton – who supported the war, and up until just the other day, defended her vote in favor – the bigness of the American footprint will soon result in a confrontation with Iran. This has been the War Party’s goal since well before the invasion of Iraq, and today we are at the end of that long and bloody road. In a rational world, re-fighting the Iraq war would be inconceivable: in the world we are living in, however, it is all too probable. If we had a foreign policy that made any kind of sense, we would partner with Iran in keeping the peace in the region: they are in a much better position to clear out ISIS. In our world, however, this is a virtual impossibility: there is too much of a chasm between Washington and Tehran. Indeed, the present crisis could well mean an end to the negotiations over Iran’s nuclear program, if and when push comes to shove in Iraq. Our present conundrum is entirely self-manufactured: there was no Al Qaeda presence in Iraq prior to the US invasion, in spite of the Bush administration’s ridiculous attempts to hold Saddam Hussein responsible for the 9/11 terrorist attacks. The repressive measures taken by the government we installed – remember those purple-stained fingers that were supposed to symbolize a New Dawn for Iraq? – have done more to consolidate support for ISIS than any other single factor. Our efforts to overthrow Syria’s Ba’athist regime have given ISIS and other radical Islamist groups the space – and the means – to create their "caliphate" in northern Syria and Iraq, where ISIS recently dismantled the border posts. I wonder how many US-supplied arms to the "moderate" Islamists have gone into the hands of ISIS and its allies. The present mess in Iraq has "Made in Washington" written all over it. But not everyone in Washington is crazy, and the proof is a bipartisan effort to repeal the Authorization for the Use of Military Force (AUMF) in Iraq. Cosponsored by Senators Rand Paul (R-Kentucky), Ron Wyden (D-Oregon), and Kirsten Gillibrand (D-New York), the measure has widespread support, including from some very conservative Republicans like Mike Lee (R-Utah). If this effort succeeds, it will be a huge roadblock in the path of the drive to start Iraq War III. After all, how is one to make the case for re-intervening at the very moment the official end to the war is being certified? The last time the War Party tried to pull a fast one – during the alleged Syrian "humanitarian emergency," when Obama was intent on bombing the regime of Bashar al-Assad out of existence – the American people rose up and put a stop to it. It’s not hard to imagine a similar eruption in the case of this latest made-in-Washington "crisis." This is the only factor keeping the Obama administration in check: fear of the political consequences. Which is why we need to keep up the pressure – and step up the fight for a noninterventionist foreign policy. The British have completely excused themselves from this conflict; their Foreign Minister has clearly stated that "there is no question of British troops going back to Iraq..."
The yanks have lived up to their reputation....completely ruined Iraq in name of freedom and democracy. Why did they go their again? WMDs was it? f@cktards. ISIS has become to Turkey what Taliban became to Pakistan. I believe the only way out of this mess is to distinguish between terrorists/thugs and sects/religions. And the final outcome of such shady acts is blowback. I dont know why the ME rulers are so stupid to create and rely on such terrorist organizations. West in general is smart and dont do it in their territories or neighboring territories. The Saudi Petro-Dollar producing favorable results for them. Their Salafi-Wahhabi goons finally finding some success after their drubbing in Syria!!!! NATO will give support to all moderate Sunni and non-Sunni nations. They will also stop supporting the extreme/intolerant Muslim countries gradually. Supporting a bunch of 30 countries that can't agree among themselves is a lot difficult than supporting 3-5 countries trying to get a consensus. Edited by Felicius, 13 June 2014 - 08:40 AM. I am not disputing anything about what you have said. Picture is not simplified as it seems. There are multiple objective that west would like to achieve but one objective at a time is the strategy. It is a historical fact that Iran Savafids shias their current decedent have always worked with the outside invading forces in the middle east, be it the Mongols, Hashisheens, European Crusaders or the British empire. What is going on right now is just another episode of what was started after the fall of Ottomans. Iranians wants their black crescent and The Arabs are ignorant and high on nationalism. No one sees the bigger picture. Muqtada Al-Sadr was probably the most fierce resistance group the yanks faced. Problem is the hatred amongst these two sectors triumph their unity and love for Iraq. Each sector has committed savagery unto one another...unspeakable savagery. But the problem is who wants to visualize the bigger picture and let it go? If France, Britain and Germany went by the same principles Europe would be a completely different place at this moment. It has been time to move on and look towards the future instead of dwelling in the past. Can we imagine protestant, orthodox and catholic countries doing what we do in the Muslim world? It is a laughable notion. Muslims should realize that there are different sectors with people having their own variations. It is either you learn to live with tolerance or you remain in the same sh!thole which the "ummah" is at this point for the past centuries. Each sector should respect their boundaries and the boundaries of others.....interfering, not letting others live and playing games has turned us into Europe of the Dark Age....only much worse because of technological advancements; easier to kill and defame people. About the Hashashins....they actively tried to fight the Mongols when they invaded the caliphate. Heck they tried to assassinate Genghiz Khan directly which led to the Mongols destroying them completely at Alamut. 1) Obama will not be sending troops into Iraq. 2) Iranian Quds force is being deployed alongside government forces. For now America wont be sending no troops, but when everyone is tired of fighting and exhausted then they will. Look at the history, First and Second world wars. American came into both wars once everyone was tired and exhausted of fighting. Right now, Europeans wont go along. Public opinion is not doctored properly to the point where they can give themself a freedom fighter, democracy bringing warriors. But it will happen eventually. I would have agreed with you IF it were not the Americans themselves who went in first. You're right, if we look at the history.....this is the repeat of what happened in Soviet-Afghan Insurgency; US abandoning the region after it's goals were realized. The US did not go back into Vietnam as well although Vietnam went through the exact same situation Iraq is going through now. I suppose there will be airstrikes or drone strikes but no boots on the ground. Especially since the Brits have clearly excused themselves, without the "coalition of the willing" yankis will not risk any adventures.